These days, $1M seems to be the golden figure that everyone aims to attain before retiring. I know there is this great debate about whether $1M is enough, but hey, $1M can get you by for many, many months. There you go. I tabulated the figures for easy reference. It’s one thing to know how much to save monthly, but the real challenge is to get down to doing it. Here’s 3 tips I have to help you guys attain your own financial goals. They are simple, but you might be surprised how hard they are to actually follow-through with! TIP 1: SAVE MONEY, REALLY. Yes, save money. This is so easy to say, but difficult to do. I remember that in my younger days, after receiving my first paycheck, I went out and quickly spent half of my salary on a ‘gift’ to myself, as a reward for seeing the first stack of cash come into my bank account. I quickly learnt that I did not actually need that gift, and that saving money was very, very difficult, especially since you know that your income is certain! If there was one piece of advice on how to actually save money, it is this: PAY YOURSELF FIRST! It is surprisingly difficult to get yourself to do this, but you must learn to pay yourself first. Paying yourself first doesn’t mean buying something for yourself; it means moving money out from your paycheck into a savings account or investment account on a regular basis. Perhaps its tough for the first few months, but new habits take time to form and when you actually get down to it, you see that it is a very useful habit to have. In fact, if you have children, it would be good to start teaching them this from a young age. “Pay yourself first, and then spend what you have left” is a good way to instill financial discipline in the younger generation. Before you ask “How much do I need to save?”, why don’t we just get down to the first step, which is to actually start saving money? FAST money: trading income, bringing in quick gains. Trading is the way to quickly build up a portfolio and invest in dividend-yielding counters or REITs. Once you’ve stuck to a simple trading strategy, repeating it over time is bound to yield significant profits, much faster than you would in a fixed deposit or by holding the stock index for 5-10 years. SLOW money: passive income, bringing in smaller but consistent gains. For those with lots of money, they can allocate much of their portfolio to more stable assets, like dividend stocks, the stock index (it brings a dividend as well! ), or other longer-term bonds. Most people want to use fast money all through their life, but it is unrealistic. As we age, we have less and less energy and time to continually engage the markets, so the goal is always to have a large war chest that brings in true passive income. Learning to do so requires some dedication and bumping your head in the wrong places at first. That’s why I always recommend that beginners take up forex trading; they’ll be exposed to market volatility, intra-day and longer-term trading, and also different asset classes by trading oil, gold, wheat, the stock indices, and bonds. Furthermore, you need as little as $500 to start with, and the cost of failure is very low. It is remarkably difficult to do something simple over and over again. Want to lose weight? Exercise and eat healthy. But how many people actually keep to this? Want to become better at socialising? Spend more time with people rather than with your phone or computer. But how many people actually keep to this? Want to learn to trade? Stick to 1-2 trade setups, and repeat these trades week after week. But how many people actually keep to this? It is very, very difficult to do what is simple and boring. In fact, it is the boredom that kills most traders! One thing that experienced traders fail to do that knocks them out of the game is this: they fail to keep reading, reflecting, and honing their craft. Continuous learning has to be part of your investing plan. After all, most people only want to invest money, but don’t want to invest the time to learn how to be profitable. How much returns is good returns? Well, that depends on your goals. There is a trading strategy for every level of returns. A conservative 10-20% returns as a trader is possible and you generally take a lot less risk than someone who wants 100-200% returns a year. Depending on when you want to retire, you need to find out how much % returns you need a year, and look for a strategy that gets you there. IT’S BORING, BUT YOU NEED TO TRACK YOUR PROGRESS! 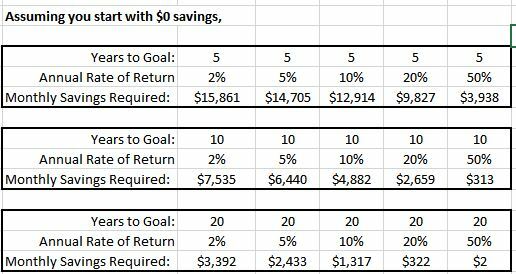 Suppose you want to save $1M, it’s extremely important to track if you are on target, and see if you need to allocate more funds to fast money or slow money. If you are proficient with MS Excel, you should be able to come up with a table for your income, expenses, savings, investment returns, and projected net worth by whatever year that you are aiming to retire by. I hope this article brings you to your feet and gets you started on your quest for financial freedom. Maybe for you, the first step is to actually start saving money! Starting where you are is all you need to do. With every step you take, you’ll be one step closer to your goals. Testimonial: "Great to Learn a Hassle Free and Systematic Way to Trade"
Testimonial: "Good Coverage of all the Areas needed to Become a Good Trader"
Testimonials: "Simple to Understand and Practical to Apply Almost Immediately"
Trading & Travelling | Heading off for a 2 week Holiday! Testimonial: "Great Complement with Technical Analysis and Fundamental Analysis"
Top 3 Reasons Why You Should Start Investing in 2017 Travel Ideas: 5 Little-Known Travel Destinations Which Will Blow Your Mind!